The Gold American Eagle coin is recognized around the globe as one of the most diverse programs available in the precious metals marketplace. 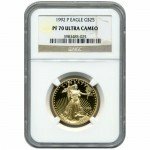 Gold Eagle coins are produced by the United States Mint for investors, collectors, and coin exhibitors in a total of four different weights, including 1 oz, ½ oz, ¼ oz, and 1/10 oz. 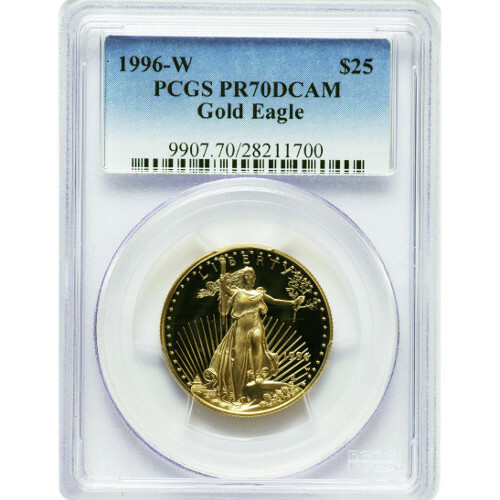 Right now, Silver.com offers the 1996-W ½ oz Proof Gold American Eagle coin for purchase. Arrives in a PCGS protective slab to ensure coin’s perfect condition. Tenth issue of ½ oz Gold American Eagles! Consists of one-half troy ounce of actual gold weight. Face value of $25 (USD) is fully backed by the US government. Issued a PR70 grade from the Professional Coin Grading Service. Available with a “W” mint mark from the West Point Mint. The United States Mint unveiled its series of American Eagle coins for the first time in 1986 with the release of the silver and gold versions of the coin. For each edition, the US Mint choose a historic image from American coinage to use as the primary obverse design, while tasking a modern-day artist with the creation of a reverse image. For the Gold American Eagle, the most popular and beloved gold-coin design from American history was chosen for the obverse. Augustus Saint-Gaudens’ 1907 depiction of Lady Liberty as a guiding force from Washington D.C. was chosen for the Gold Eagle coin. Saint-Gaudens was tasked directly by President Theodore Roosevelt in 1905 with reviving American gold-coin design. Scultpor and artist Miley Busiek was commissioned by the US Mint in 1986 to design a reverse image for use on the Gold American Eagle. She had previous worked on numerous sculptures featured on private property and on federal government property, and her image is featured exclusively on the Gold American Eagle. On the obverse of all 1996-W ½ oz Proof Gold American Eagle coins is Saint-Gaudens’ depiction of Lady Liberty. The reverse bears Busiek’s vision of a family of nesting bald eagles. Each coin in this Silver.com listing bears a PR70 grade from the PCGS. These coins have their full, original mint luster and no detracting flaws. Deep-cameo is a term that defines a coin with a strong, frosted design set overlaying a deeply-mirrored, clear background field. Graded Proof Gold American Eagle coins are sought after in anticipation for gold’s continued historic value, which you can monitor minute by minute via our active charts that show current market value of gold. If you have questions, please feel free to reach out to Silver.com at 888-989-7223, chat with us through our website’s live service, or send us an email.